2016 has been a big year for development, and by “development” I mean the process of getting new homes built, or any other new buildings for that matter. In the last “development update” post for the year, I wanted to look back at some of the highlights which you might have missed. You can click through to these at the bottom of the RCG Development Tracker page. January focused on retail. “Up until 2007, the retail sector was on a roll, and new shopping centres were being built all over the place. That changed when the recession hit in 2008 [but] 2015-2016 sees the biggest expansion since the GFC”. In March, I covered some research I did with RCG, and some other housing stuff. “In the long term [attached homes will] make up at least 50% of the new homes we build”. I’ve picked that in 2017, we’ll consent more of those than detached houses. Will we get there? Hard to say at this point. June was all about housing. I looked at the pipeline for ‘attached dwellings’, which I’ll update in the new year. August focused on Stonefields, a 2,500-home development. “Looking at Stonefields today, you could be fooled into thinking it’s almost finished, but the reality is it’s not even halfway”. November looked at some of the housing projects which haven’t gone ahead, for various reasons. The RCG Development Tracker has an interactive map, now showing 827 projects across the country, including every brownfields Special Housing Area, big growth nodes like Hobsonville Point and Stonefields, plus billions of dollars’ worth of retail, office and accommodation developments. In Auckland, we’re building some of everything. Shopping centres, offices, industrial buildings; hotels and other accommodation; and of course homes of all types and sizes. Apartments, terraces, retirement villages, and “traditional” detached houses (more on those later). Just about everything is booming. This year I’ve written on the tourism boom, migration boom, international education boom and construction crunch (which is really a boom as well). So those are all positive, I guess, but there are issues that come with them. The big issue being a shortage of housing, with real effects on people’s quality of life. Other issues being high construction costs, and what looks like low wage/ productivity/ real income growth (so we’re not that much better off on a ‘per capita’ basis). Plus, there are some wobbles starting to emerge: house prices flattening or starting to fall, and signs of real problems in the international education industry. How many homes are we really building? Most months, I put together a graph showing the number of building consents for new homes. This is a good indicator of how many homes are going to be built. By the time a development gets its building consent approved, it already has planning approvals, and the design is pretty much complete. The developer has 12 months to start building (otherwise the consent expires), and almost all consents do eventually turn into homes. There’s obviously a lag between building consents being approved and the home being completed. Historically, the average lag is about six months, but this lag is getting much longer. Only 7,700 homes were completed in the 12 months to June 2016, but 9,251 homes were consented in 2015, and 7,632 were consented in 2014. So, consents do get converted into homes, but we’re well behind on doing it. There are two reasons for the delays. One is that builders everywhere are busy, so they’re struggling to put enough resources together. The other reason is that apartments take longer to build than terraces, and terraces take longer to build than detached houses. 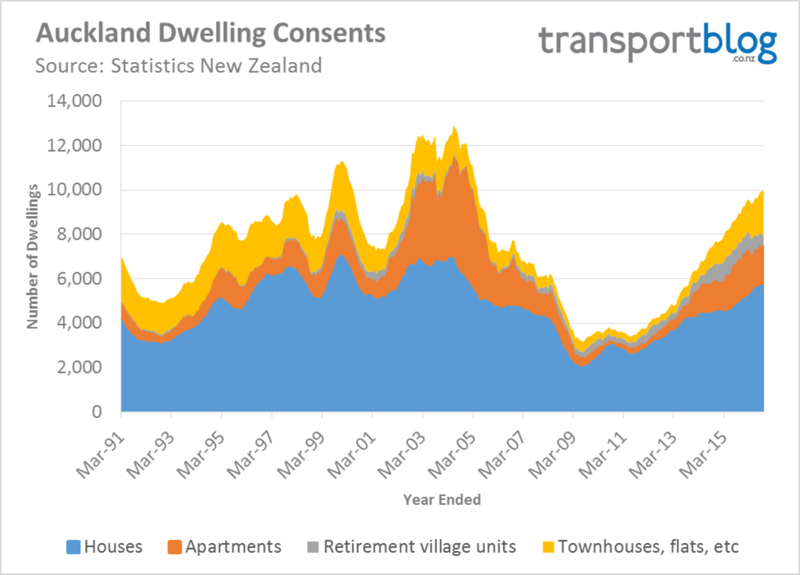 As Auckland builds a larger share of attached dwellings, the lag between consents and completions would be getting bigger even if builders weren’t flat out. At a guess, we probably need to allow at least two years for apartments from consent to completion, and at least one year for terraces. So does that mean that we need to build more detached houses if we want to solve Auckland’s housing crisis? Surprisingly, the answer is no – in the long term, we’ll get more homes built if we focus on attached homes, like apartments and terraces. There’s nothing very traditional about the detached houses being built today. They average a whopping 235 square metres – what is that, six bedrooms? – and they’re often double storey, with complicated shapes compared to the brick-and-tile boxes of the past. Plus, they’re mainly on the edges of the city. Affordable housing they are not. Apartments and terraces, of course, tend to be much smaller in size. Although they cost a bit more to build on a ‘per square metre’ basis (especially for apartments), they tend to be cheaper overall. And on that note, have a great summer everyone, take care when getting around and remember to wear sunblock! * Motorways aren’t shown; they get enough attention already. Suffice it to say, the government is widening pretty much any motorway they can, and trying to put new motorways anywhere they can, and the costs are never questioned. The question for Auckland is the construction boom big enough? Alongside the construction boom is a population growth boom. One easy way to determine whether the construction boom is big enough would be to divide the new residents by new houses. If the resulting number of new residents per new house is below the average existing occupancy rate than the construction boom is going to eat into the housing shortage. If the number is greater it is not. It’s actually worse than that too because average household size is decreasing. Auckland’s average occupancy rate is 3.0 and I think the national average is 2.7. As you say Sailor Boy housing occupancy is falling. This fact alone means we need more houses. In particular more smaller houses. Bernard Hickey discusses some failed Auckland apartment developments and the numbers for the construction boom vs population growth here. Bernard says Auckland is only building one new residence for 4.5 new residents which is well above Auckland’s average occupancy of 3 people per home, so the housing shortage continues to worsen. Really quick answer to that is “no”. Auckland’s currently growing at 40,000 people a year or more – we probably need 15,000 homes a year just to keep up, or more to make inroads into the undersupply we’ve built up. Consents are just about at 10,000 a year, and completions are at 7,700. That’s a good article, David’s done some really good pieces on housing. But I don’t think anyone’s really highlighted (except for Winston Peters!) that there’s a gap between consents and completions, which is an issue in itself. I meant to emphasise that in the post, possibly could have drawn more attention to it. It is interesting the difference between consents and completions. Do you think the lag is increasing or there is an increase in non-completions? Time will tell, but I think it’s almost all in the former. There have been some high profile cancellations etc, but almost all of those projects won’t have had their building consent. There are some cases, e.g. Parnell Central Apartments next to my office apparently had its building consent a few years back but didn’t happen, but usually by the time developers have sunk the costs into getting their consent they’re more or less committed to starting. In 1946 NZ had a housing shortage of 26,000 families. Production had slumped during the war years and needed to ramp up again. So the situation had some similarities with now, although I suspect land banking wasn’t such an issue back then. Back then the State was very much part of the solution. Here is a good documentary about the 1946 housing situation and plan to rectify the housing shortage. It is about 15 minutes long. Curious that you say that Terraces take longer to build than stand-alone houses… I would have thought the opposite would have been true? Terraces tend to be smaller than stand alone houses, tend to have more pre-prepared components (tilt slab) and/or share components (common walls). Also on a site certain things are shared (the site itself, driveways, piping etc. But you’re not building a terrace. You’r building 10. Takes longer to get a builder big enough and buil 1000m2 of floorspace than to get any builder and build 150. That is an artefact of how we restrict development over here. It is possible to develop terraces the same way as stand-alone houses. One house at the time, no need for a “big enough builder”, and no need for someone with enough capital to make a big commitment up-front. It has worked like that in lot of places in Europe for centuries. This is very noticeable in these places: you have entire streets of terraced houses, but the houses have a different design and a different height form their neighbours. Yup that’s right, plus it’s more efficient for the builders to roll their crews across the different units in stages. So you don’t have 10 terraces all being at the exact same stage of construction – you put up most of the structure, then start to work in a couple of them on a particular task, then move the same people onto the next unit to do the same task, etc. Otherwise you’d need, for example, 10 plumbers all going at once when you get to that point. Easier to get 2 plumbers and move them from one unit to the next, like an assembly line. Plus, it’s not that a detached house takes six months to build, or that a terrace takes one year etc. It’s just a bit of an ‘average’ from consent approval to completion. It’s probably more typical for a detached house to take three months to build, but the consent is obtained a little before construction starts, or it’s a single consent for 10 houses and some of them are built a little later than the others, etc. St James Suites apartment development canned today. Need for thinking outside the box. Or we could tax capital gains so that you pay tax when you sell unimproved instead of just lumping developers with a tax burden. Yes, CGT is essential, but won’t ensure any more houses built in 2017. +1, I just think tax breaks are a terrible idea. Tax the negatives (land banking) rather than removing other taxes for positives (building a house). The tax system works best when it doesn’t have loopholes and one-off exemptions. Further regulation of the banking system is a better solution.